Reason why many diets tell you not to eat after a certain time in the evening is because eating in the evening makes the body store more fat because it is not burned off with activity. It’s not when you eat that’s important, but the total amount you consume in a 24-hour period. The only thing that will stop you losing weight is if the calories in your evening meal added to the calories you’ve eaten during the day equal more than the calories you’ve burned during the day. So get into the habit of planning ahead. When I’m shopping I always read what I’m buying and what benefits are. Food manufacturers use front label trickery you that their brands are healthy. Don’t be fooled – always read the ingredients and Nutrition Facts. 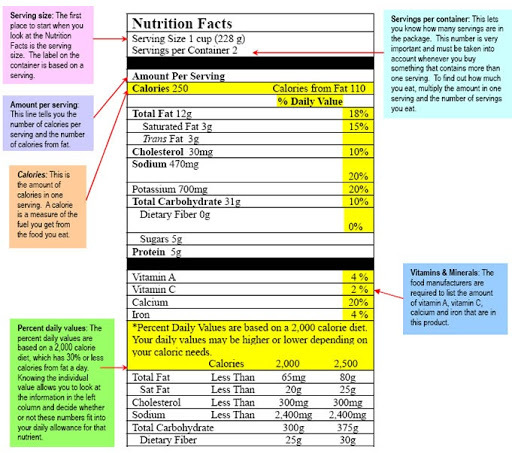 Taken together, the information on all three labels will help you make the healthiest food choices. You’ll quickly see that many food items actually have hidden trans fats and high amounts of sodium, preservatives, and artificial flavorings. They are anything but healthy. · “Fortified”, “enriched”, “added”, “extra”, and “plus” usually mean the food has been altered or processed in some way. · “Fruit drinks” usually means little or no real fruit and a lot of sugar. Look for products that say “100% fruit juice”. Remember Ingredients are listed in order of most to least amounts. That means the first ingredient will be in the largest quantity. The second is the second most and so on. ■ “Enriched flour”, “wheat flour”, or “unbleached wheat flour”: all means small amount of whole wheat added. ■ “Partially hydrogenated” or “hydrogenated oils”: Trans fats. ■ High fructose corn syrup: It’s just fancy word for sugar. ■Artificial food colorings: Chemicals used to add color to foods. There are many more ingredients that we could list, but here’s my rule of thumb: if a food item is packed with lots of ingredients that you can’t pronounce (they are artificial sounding) and it includes trans fats, you should look for a better food choice. Try to stick with products that are made from whole foods, with little to no preservatives, and with little to no artificial sounding ingredients, and definitely no trans fats. My 7 day juice fast is complete I’m so THRILLED with the results! Day 6 & 7 were very much like day 5. I lost 5lbs I’m 5’5 its really noticeable on me. My skin is radiant, soft and completely clear of any pimples or blemishes. Energy restored feeling lightness, energetic & I have been headache free since day 3 of the 7 day juice fast. The idea of a healthy lifestyle and treating my body with the love and care it deserves actually excites me. I’m looking forward to playing with new healthy recipes. If you’re thinking about doing a 7 day juice fast check out my tips – under Tips and Facts! Day 4: When I woke up I had energy and headache free throughout the day. I’ll be honest I had bunch of mixed emotions, it was only the smell of cooked food tickled my strength and determination. It’s insane how powerful the smell of cooked food is when you deprive your body it. I didn’t run away, I just went into the adjacent room and took deep breaths, taking note of how much more aware I was of the scent. My skin is starting glow and completely clear and. I know I’ve lost weight but I’m not weighing myself until the end of the fast. My plan is to get a fitness routine written down first and then to jump on the scale for encouragement. Day 5 of my juice fast felt light and healthy. I started the mornings with hot water and lemon instead of running to the juicer. It was better than Day 4 where I felt way hunger pangs and triggered by smells. One big lesson I hope to learn from this is being able to eat when I need to eat… and still, no headache. For anyone who is still bouncing around day 1 or 2 (or even 3, in my case) STAY STRONG. Don’t let go. Fight. You have to experience rock bottom to really reach this state of euphoria – but it’s so worth it. Not only do I feel amazing, but I also feel healthy. Starting my 7 day juice fast tomorrow. I am very excited about completing this challenge. I feel pretty positive about the whole thing. It’s not just weight lose plan, but it’s to improve health, detoxing, and cleansing, reversing disease and improving total wellness, transitioning to a healthier lifestyle and to achieve higher nutrient absorption. What’s juice fast diet? Juice fast is type of detox and fasting which a person only consumes raw fruit, vegetable and water. It’s methods of detoxification due to the reduced food intake and absence of solid foods. My Goal: Detoxification, Cleansing, to improve my energy levels, and to end unhealthy cravings. My 7 Day meal Plan: You don’t have to follow it 100% you can add or subtract different fruit and vegetables.